Wat is dit voor site? Wij zoeken de goedkoopste boeken op internet. Home Decorating For Dummiesvonden we het goedkoopst op Bol.com voor €15.99. We hebben gezocht in nieuwe en tweedehands boeken. Rechtsonderaan de pagina kan je het boek direct bestellen	via Bol	.com. Do you long to create picture-perfect rooms but can't quite seem to achieve them? Do you want better functioning spaces for working, playing, or living? Do you clamor to express your personal style? If you said 'yes' to any of these questions, you've turned to the right source for real answers from the pros. 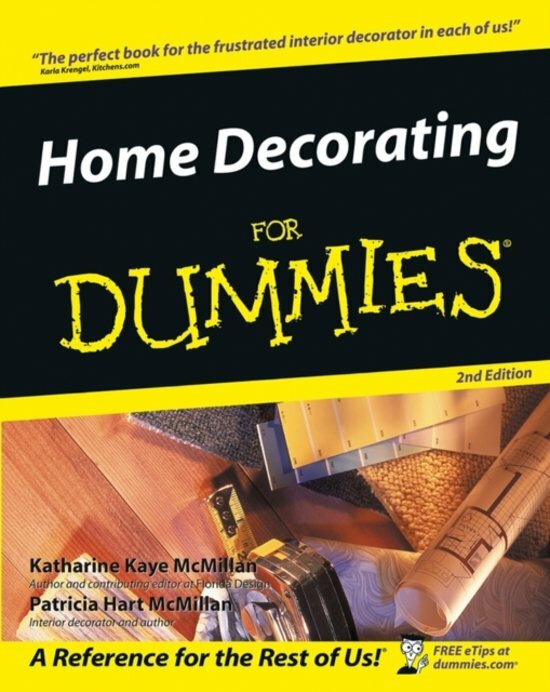 Home Decorating For Dummies, 2nd Edition is for all kinds of people in all kinds of decorating situations, including: first-time buyers or renters. You have a whole new place to decorate. Where do you start? Second- or third-time home buyers. Whether you've gone up or down in size, stayed in the same region or moved to a whole new one, you need to know how to make your old furniture work in a new setting, how to add furnishings, and how to make your style seem fresh. Newly blended families. He has furniture, she has furniture, they have furniture. Can it all work together harmoniously? Indeed!And anyone else who loves decorating. Don't forget: Imagination counts. Each part of Home Decorating For Dummies , deals with a broad area of decorating, and each chapter contains specific and detailed information. You'll discover tips on basic planning - where to begin when you want to start decorating; creating surface interest - the effects of color, pattern, and texture, and the problems created by too much or too little of them; creating backgrounds - what you need to know about the special decorating requirements of your walls; and tackling tough rooms - how to effectively decorate rooms that have special functional requirements.Accessorizing with art and other stuff - adding the final flourishes to every space in your place Home Decorating For Dummies, 2nd Edition contains all the basics - including how to figure out what you can spend; how to spend it; and the latest and greatest in styles, trends, and technology. What do you do with your space next? The possibilities are endless.